Welcome Back to Machi Koro, the card game that is sweeping the world! Greetings, Mayor of Machi Koro! Your influence has led to explosive growth in this once sleepy town. Skyscrapers pockmark the land and nightlife is booming. Our little Machi Koro…the city that never sleeps?! One day, perhaps. Until then, our darling, temperamental Machians want more. On the docket to grow this mid-size city into the bustling metropolis they think they deserve – A shiny new airport for red-eyes, swanky Member’s Only clubs, wait-list-only sushi bars, and seemingly endless extravagance! For our mayors, Machi Koro: Bright Lights, Big City is a profoundly different beast and not just in terms of expensive tastes! Get ready for a whole new twist on Machi Koro – new cards, new rules, and a whole new way to play ensure no two games will ever be the same. 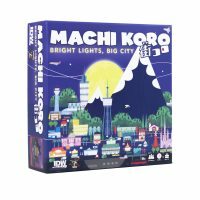 Machi Koro: Bright Lights, Big City is a fun twist on the smash hit Machi Koro and a must have for new and experienced mayrs alike! Add a Review for "Machi Koro: Bright Lights, Big City"